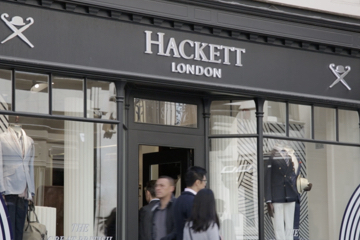 Upmarket clothes retailer Hackett used StoreForce Workforce Management Plus)platform to increase sales by allowing them to maximise the effectiveness of its sales team. Leading British multi-channel menswear retailer, Hackett has increased the effectiveness of its shop floor workforce helping to drive up sales thanks to StoreForce’s WFM+ (Workforce Management Plus) platform. Founded by Jeremy Hackett and Ashley Lloyd-Jennings in 1979, Hackett has grown to become a premier British menswear outfitters, specialising in gentlemen's formal shirts and associated clothing. The brand has developed a reputation for impeccable tailoring and luxurious casual wear, exporting its version of British style to a total of 77 store in 16 countries globally. The retailer has earned a reputation for customer service excellence with store associates routinely trained in hospitality, as well as tailoring. However, the Hackett board wanted to maximise the effectiveness of its sales team - boosting revenue and creating a more dynamic team structure, while aiming to achieving new heights in customer service. The company faced challenges on two fronts; competition from outstanding online multi-brand retailers and increasing payroll, rent and business rate costs. Senior management had discovered striking disparities in the way sales teams were being deployed from store to store across its global estate. Their goal was to find a digital solution that would standardise best practice scheduling, help set ambitious achievable targets and motivate the sales team. StoreForce’s WFM+ platform uses real-time store sales data to identify individual stores' weekly top 20 trading hours. The solution tracks the sales performance of individual members of the sales team. It can then combine these two data sets to automatically create a schedule ensuring the most effective sales people are on the shop floor at peak trading times to capitalise on increased sales opportunities. WFM+ also sets hourly targets both for individual staff and stores. This information is visible on a smart phone app dashboard with indicators that are either green for an achieved target, amber for nearly achieved or red for missed. Hackett store sales team members can also see results for other branches adding a competitive and motivational aspect to the solution. Since implementing WFM+, Hackett has reported an increase in both its average transaction value and conversion rate, which has led to an increase in sales. In Hackett's words, this is because the company has 'the right number of staff working at the right times to capitalise on the most profitable trading times of the week'. Previously some hard-pressed salespeople were rushing to get customers to the till so they could serve the next customer. With the right staffing levels in place, however, store associates now have enough time to deliver the trademark Hackett customer service, educating the customer, and both cross and up selling products. What’s more, the StoreForce WFM+ dashboard has made the sales team members more commercially aware. Thanks to live sales data on the solution dashboard, colleagues are kept up to date on how Hackett is performing on a store-by-store basis. StoreForce - Hackett Case Study Final from StoreForce Solutions on Vimeo. Since implementing WFM+, Hackett has been able to reduce its payroll costs whilst improving sales. It has invested the savings back into other key parts of its business. Nik Porter, head of retail for Northern and Central Europe, said: “The biggest difference since we started working with StoreForce is the improved trading culture. We have a sales team that is incredibly dedicated and loves the Hackett brand, but in some areas may have been a little commercially unaware. The StoreForce solution has changed all that, bringing everyone up to speed.